Hi everyone. Today is the start of the CAS Watercolour April Challenge. I'm hosting this month and I chose a flower that I LOVE to watercolour. I hope you'll check out the challenge blog to see the gorgeous poppy cards from our wonderful Designers, and our very special Guest Designer, Rachel (Creating Paper Hugs). Then come play along. 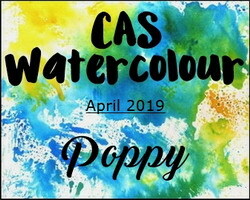 Make a CAS design with a watercoloured poppy or poppies and join us! So glad you used that poppy I gave you. 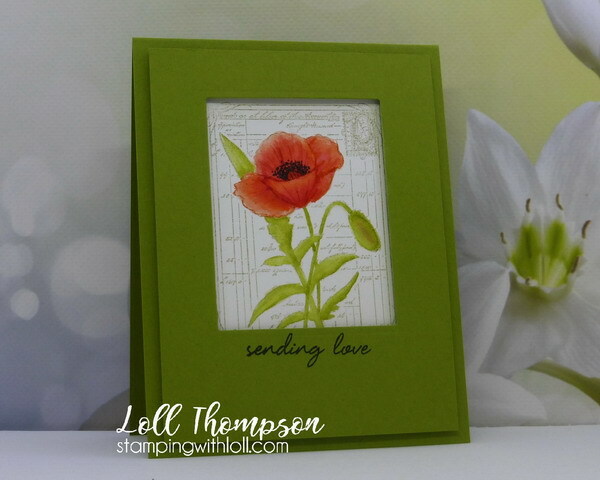 I'd thought of using mine but saw yours so chose a different poppy stamp - I realize I have more than enough poppy stamps!! Love how you coloured it - just like the Oriental poppies growing in my garden. And leaving the background plain really let the poppy stand out. Wonderful to see you using a coloured frame and card base! Beautiful, Loll - Love that persimmon color on poppies!! I really like the text bg and the colored card base too, a grand card!!! Lovely as can be! Such a pretty flower image! Great text background and pretty colors! This stamp is awesome, Loll, and even more awesome the way you've added your watercoloring! Love the olive "white" space. It gives the poppy and even richer look! Great challenge, my friend! I've always admired your skill with watercoloring but this time you hit one out of the park! The detail on your poppy is amazing and at first glance I thought it was a fussy cut print. Outstanding Loll! How gorgeous, love that image and the way you watercoloured it....so elegant. What a beautiful poppy! And, therefore, what a beautiful card. Love the colors and that bit of detail in the background. So pleasing! What a unique stamp this is with it's own background. Your water color is lovely and vibrant. The green frame compliments it so well. It's like I could pick it right off the card, Loll. Perfect no-line coloring. Gorgeous and delicate watercoloring of this lovely poppy image, Loll! I love the way you left the highlights and added the black in the center. The Olive Polaroid look frame is fresh and cool! Simply stunning Loll. 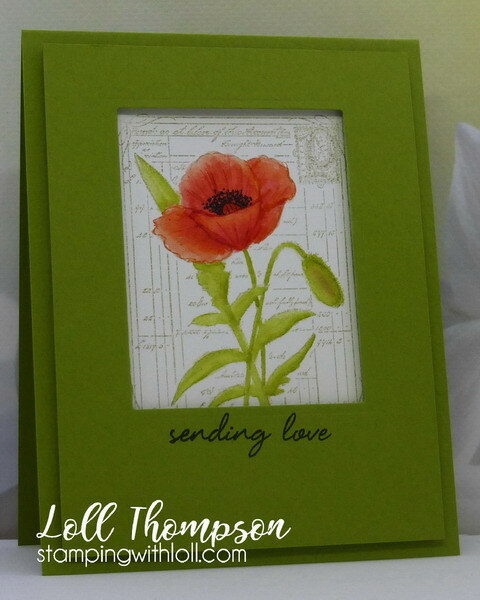 Beautifully coloured poppy and the background makes it pop as does your perfectly matched card stock. This is gorgeous, Loll. Love the rich colors and your vibrant focal image. Beautiful inspiration, Loll. I love the colorful card panel, it's rare for you :-) But this deviation looks really amazing.